I’m a really big fan of that strange soul format of male duos – and here’s another one. 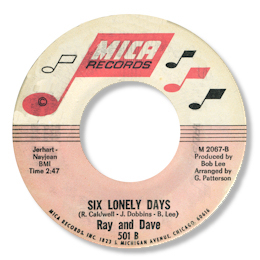 Ray & Dave only had just he one release on Al Benson’s Mica label in 1966 which was produced by the legendary Windy City music man Bob Lee. Both sides are well worth hearing. “Wrong wrong wrong” was one of those easy paced beat ballads so prevalent in Chicago in the mid 60s, just oozing charm, no wonder it sold so well. But the flip Six Lonely Days is even better. The song is based on classic doo wop chord changes and has a highly memorable melody – you’ll find it sticks in the mind like glue. A wonderful arrangement from Mr G Patterson (check out those superb horn charts) is matched by some great harmonies from the guys. And their gritty interplay is right on the money too. Apart from the fact that they came from the South Side I know nothing about Ray & Dave at all – but I wish they’d made many more tracks like this one. He thinks that "Dave" is named "Dave Brown" but he is not sure. The Ray & Dave 45 and Jimmy Dobbins 45 were all cut at the same sessions at Chess studios. All 3 of Jimmy, Ray and Dave sang on all tracks (except "What Is Love" Jimmy solo), and Sugar Pie DeSanto also sang on "Little Miss Perfect"! So it was strange that 1 45 was credited to "Ray & Dave" and 1 45 credited to "Ray & Dave". Jimmy Dobbins came from Mississippi and he was really called "James Brown". He was not a keyboard player just a singer. Ray Caldwell wrote all the songs. The records were released in late 1965. I'm very grateful to Bob Abrahamian for the music qand the interviews - and to Naoya for providing me with the link.